Thames & Hudson, 9780500651537, 32pp. Flick's dog, Benson, is a very good boy. He waits for her at home and he never chases anything . . . or so Flick thinks. One day, when Flick leaves for school, Benson chases a cat into the back garden, over the fence, and into the park, where he pursues a squirrel. A ball catches his eye and he follows it into the pond--and then he runs, dripping wet, through the middle of a picnic lunch, stealing a sausage. As the picnickers shout, "Go home, Benson ," he races back across town, darting through the back door just as Flick arrives home from school. "Have you been a good boy, Benson? Did you stay?" Flick asks. Only the reader really knows what Benson has been doing all day. 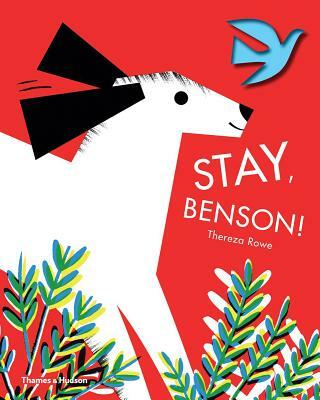 Stay, Benson is beautifully designed, featuring bold graphic illustrations and die- cut pages that entice readers to chase Benson through the book. Author and illustrator Thereza Rowe's striking images hark back to a classic style of illustration, but use a bright color palette that keeps them fresh and contemporary. The fun, simple story gives children the thrill of being in on Benson's secret adventure.